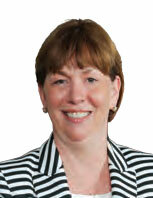 Patricia A. Rehmer, a nationally recognized leader in mental health and substance abuse and former Commissioner of the Connecticut Department of Mental Health and Addiction Services (DMHAS), joined Hartford HealthCare in March 2015 as Senior Vice President for Behavioral Health, bringing a wealth of experience and expertise in the field of mental health, substance use and addiction. She assumed the role of President of the Hartford HealthCare Behavioral Health Network (BHN) in 2016, with the retirement of Stephen W. Larcen, Ph.D.
Rehmer has nearly 30 years of experience with public and private behavioral health agencies, and was appointed Commissioner of DMHAS in November 2009, after first serving as DMHAS Deputy Commissioner from 2004 through 2009. She began her career at Hartford Hospital’s Institute of Living, a critical component of the BHN, where she worked for 17 years and held a variety of positions, including head nurse, program director for the partial hospital program, director of adult programs, and clinical director of operations. Rehmer earned her bachelor’s degree in Nursing from Skidmore College and a master’s degree in Nursing from St. Joseph’s College. She is a member of the American Council of Healthcare Executives. During her tenure as DMHAS’s Commissioner and Deputy Commissioner, Rehmer worked in partnership with individuals in recovery, families, advocacy groups and service providers to ensure that individuals have a meaningful life in the community. Before resigning as DMHAS Commissioner, she served as President of the Board of the National Association of State Mental Health Program Directors.